In the northwest section of Burkburnett, on the corner of West 6th and Floyd Street, sets a plot of living history. Although there is no building, no real visual to show of it, little to no records, now a marker sits erect on the site. That marker was placed Sept. 1, 2018, commemorating the Booker T. Washington Elementary School. 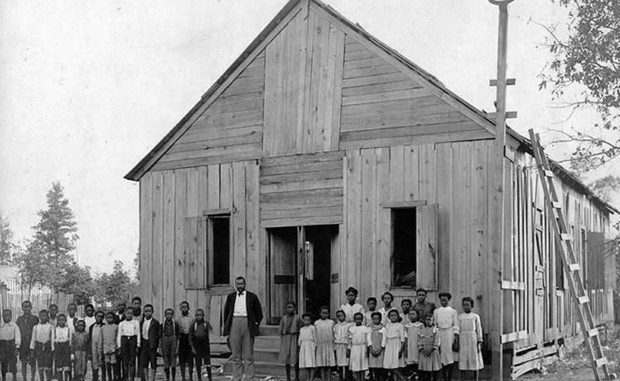 At its founding, the barn-shaped, one-room school house, an African-American school, had only one teacher administering to more than 60 students. Booker T. Washington Elementary School in Burkburnett catered to students first through eighth grade; thereafter, the children had to commute or relocate to Wichita Falls for grades ninth through 12th. Pamela Dixon, daughter of former Booker T. Washington student, Howard L. Locklin, documented the recollections and details from her father and other living students to preserve the school’s place in history. From her research, Dixon found the first African-Americans in the Burkburnett area were farm hands and likely slaves, brought by Mabel Gilbert in 1856 through 1870. Gilbert was the first known settler in Burkburnett. The position of farm hand was favorable, considering it was of elevated stature compared to that of a slave.